Chris Cillizza believes that Bernie Sanders’ one-dimensional campaign is hurting him badly. Sanders is — sorry Sanders people! — surprisingly one-dimensional as a candidate. When he is talking about the differences between the haves and the have nots, about the need for more economic fairness, why we need to reform the campaign finance system or work to address global warming, he is terrific. When he is talking about anything else, he is, um, not. Sanders built a movement in the early days of the race on the passion he exudes from every pore when talking about economic inequality. The contrast between Sanders’s “people powered” campaign and the top heavy, corporate feel of Hillary Clinton’s effort was striking. And, Sanders is, without question, closer to the true heart of the Democratic party than Clinton on the vast majority of domestic issues. I can see where Cillizza could see the campaign as being too one-dimensional. At times I do wish that Sanders would devote more time other issues I’m more concerned about, but Cillizza also misses the point of Sanders’ strategy, along with exaggerating the degree to which the campaign is one-dimensional. While it is true that Sanders concentrates on economic fairness, he has spoken on other major issues during the campaign, even if not as often. Bernie Sanders is running on his own version of “it’s the economy stupid.” Whether this is a brilliant strategy which will get him nominated and elected president, or whether it is hurting his campaign, won’t be apparent until we see how the voting goes. There is evidence suggesting that just maybe the strategy will work. Sanders, who has won elections only in a white, rural state, thinks his brand of bold democratic socialism can sell. He has never campaigned here, yet at Friday’s rally in Morgantown, miner after miner said they basically agreed with the former mayor of Burlington more than they agreed with Clinton. 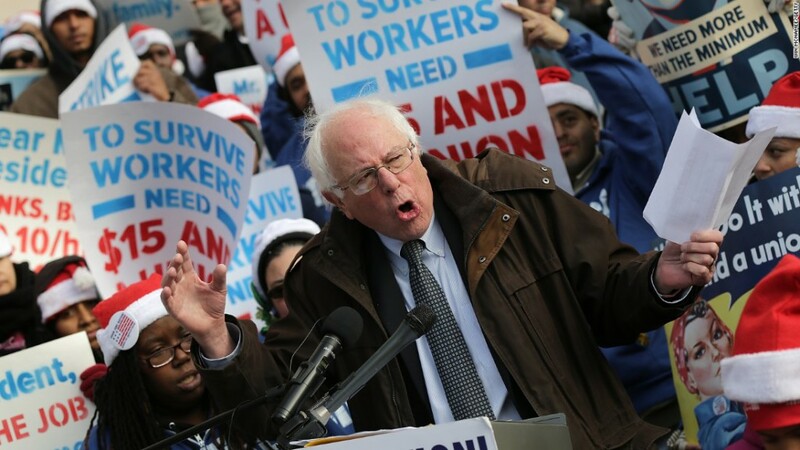 Several were aware that Sanders had walked picket lines, something that resonated as they packed a hotel ballroom to demand that Washington fully fund UMWA pensions. But Sanders believes that such naysayers are missing the weight of his cardinal argument — for greater economic fairness — and voters’ willingness to look past the other issues where they disagree. He has won elections in Vermont, a white, rural, gun-owning state, as a socialist. The social-issue “distractions” bemoaned by red-state Democrats have seemed to bounce right off his armor. (He has taken mixed positions on gun control, supporting a ban on assault rifles, for instance, but opposing the Brady Bill.) In the end, is the white guy who voted for him in Vermont any different than the white guy in West Virginia or Kentucky or Ohio who was told to blame liberals for his problems? …it’s a socialist running for the nomination of the other party who is working on the theory that a lot of Wallace rage is soft and not particularly partisan or ideological. It is only loosely attached to Trump who is, anyway, basically a clown act [with this written before the latest outrageous statement from Trump]. The problem for McGovern was that the coalition of freaks and hardhats was big enough to win him the nomination but too small and fragile to even compete in the general. Sanders’ theory of the case is that the overmatched McGovern coalition is really about the same thing (sans most of the hardhats) as the twice victorious Obama coalition. Demographic changes have flipped the odds. If Sanders can bring back in some of the disaffected hardhats, he could create a progressive revolution in this country based less on identity politics than on class consciousness. Sanders is concentrating on building a coalition around economic issues because he believes that this is what has a chance of both beating Hillary Clinton and winning a general election. While I might like to hear more from Sanders on foreign policy, civil liberties, and social issues, these might be a distraction to this goal. Besides the other choices with a reasonable chance to win are DLC Democrat (i.e. Republican-lite) candidate Hillary Clinton, and the even more conservative Republican candidates. This leaves Sanders as the only real option for those who oppose neoconservative militarism, the surveillance state, the drug war, government corruption, and conservative outlooks on civil liberties and social issues. We know Sanders is on our side from his past record regardless of how much he concentrates on these issues during the campaign. Unlike Clinton, we know that the positions he has held throughout his career mean something. Sanders is already doing well with many of the well-educated, affluent Democrats who voted for Obama and are outside the obvious target audience for his economic pitch. Now the question is whether he can expand the Obama coalition based upon economic issues and win. Posted in Barack Obama, Bernie Sanders, Civil Liberties, Democrats, Donald Trump, Hillary Clinton, Politics, Social Issues. Tags: Barack Obama, Bernie Sanders, Donald Trump, Hillary Clinton, Politics. RSS feed for comments on this post.. TrackBack URL. If Sanders can bring back in some of the disaffected hardhats, he could create a progressive revolution in this country based less on identity politics than on class consciousness. FDR died a long time ago. Democrats have not been his party for a very, very long time. Indeed. Several of my "libertarian" friends are big Bernie supporters. He is catching the imagination of people across the spectrum. Sanders is the most libertarian candidate running, depending upon the definition of libertarianism. He is the strongest candidate in terms of individual liberty, opposition to the surveillance state, and opposition to unnecessary wars. His economic views differ from libertarianism, but perhaps some see the importance of reducing Wall Street’s influence on government, and realize there is nothing really all that libertarian about such influence. It looks like Bernie Sanders is the only Candidate that will work for the people of this Country. And not just the people & Companies with money. Thank you for a much needed article. A major pillar of the FDR coalition was socialism for Southern white racists. When they defected in the wake of the Civil Rights Act, that was the end of that coalition. It appears that Sanders is trying to lure them back, all being forgiven. This however leads to some real oddities: people who four years ago were sneering at recent defectors from the Republican Party, rejecting them for the intolerable sin of dragging the Democratic Party to the Right, now brag that Bernie is inducing Republicans to defect and thus drag the Party to the Left. Which is it, guys, they can't both be true. More likely, it's just more special pleading and self congratulatory nonsense from the gang that is afraid to look reality in the face. Robert, there is sure some confused logic in your comment, which is not a good idea when you are trying to smear those who actually have it right. You are confusing quite different things. Whether we move to the left or right is based upon policies. Electing Sanders will help move to the left. Electing Clinton or a Republican would move us to the right. If Sanders gets regains the votes of working class voters (who are not all racists as you suggest), this would help him get elected, and help move to the left. Both parties seek such candidates–this is hardly something unique to Sanders.